Austin, Texas based Industrial / Alternative Rock band Adoration Destroyed has released the Official Music Video for “In Elegant Decay” from their debut record Ritual Damage, which was released earlier this year via Cleopatra Records. All the original songs on the record were written, performed, and produced by Erik Gustafson and mixed/mastered by Daniel Stapleton at www.360mixing.com. Purchase Adoration Destroyed’s new album ‘Ritual Damage’ here! Raw, visceral chronicles encased in a slick dichotomy of infectious Bass Music and Dark Pop/Electro, with even darker emotional themes. Embrace the delicious somber sonnets and electro-dirge of Adoration Destroyed… The forlorn, the obliterated…this is for You. With one eyeliner-stained eye looking back over a black-clad shoulder, Adoration Destroyed has arrived with a sound that simultaneously harkens back to the dark electronic music of the past, seductively merged with bleeding-edge production culled from modern EDM. This Austin, TX-based band features leader Erik Gustafson (also a member of 16 Volt and Noir) Adoration Destroyed has performed with God Module, Combichrist, CHANT, and SKOLD (of KMFDM/Manson) Intravenous Magazine calls them “a smoldering blend of grooving bass and rhythmic dance beats”. 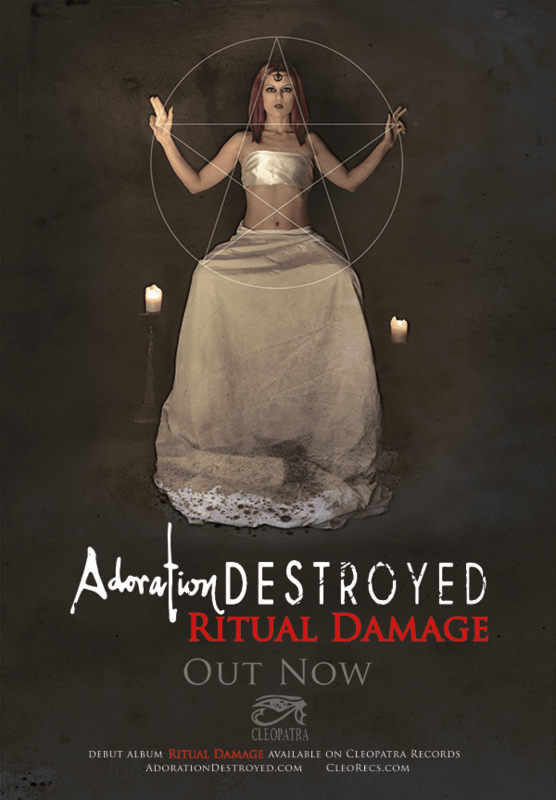 Cleopatra Records released Adoration Destroyed’s debut album Ritual Damage on September 9th. The album features superb production and fantastic cover versions of Til Tuesday’s “Voices Carry” and Marilyn Manson’s“Coma White,” along with a pair of exclusive remixes from 16 Volt and Mr.Kitty!